Note: This post is a bit more personal and off-topic than what you’d expect here, but I hope you stick around nevertheless as it covers an important part of my life and a specific project. The start of the new year is usually a time of joy; reflecting on the past year, looking forward to what’s to come in the next and setting goals & resolutions for ourselves. For my family, the start of 2009 became a time of prayer and hope. We learned my 17-year-old cousin, who’s always been an active spirit around family and friends, was diagnosed with medulloblastoma – a highly malignant brain cancer that’s most commonly found amongst children. We were devastated. It was a huge shock to us all and we didn’t really know how to cope. I was living in Virginia Beach at the time, while my cousin & family were all in Ohio; rightfully, I felt disconnected from the situation. So I took refuge with the Livestrong Organization. I reached out to them on Twitter and spoke with Brooke, who was amazing in providing me helpful information and putting me in touch with Ella, a great oncology social worker from CancerCare. From an outside perspective, they’ve always done great things – but it wasn’t until that day that I truly understood their cause in helping fight cancer and supporting those diagnosed and surviving this disease. It was at that time and while my cousin was going through numerous chemo and radiation treatments that I wanted to do as much as I could in helping him & others fight. I was able to come back home and give him support as his older cousin, but I wanted to do something even greater in scope. That’s when I got in touch with my awesome friend, Shannon Farrell. She had an amazing idea to create awareness for specific charities while bringing together a community of supporters through a single cohesive act – jumping. In came SkyAide. The concept is as simple as it sounds. We wanted to demonstrate the power of the people – not just by giving them the ability to donate to a wonderful charity, but by allowing them to demonstrate their support by literally jumping for a cure through an online photo blog. 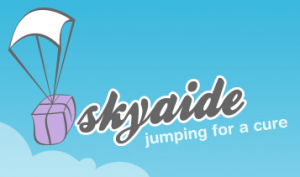 SkyAide gives you that power by allowing you to upload a picture of yourself jumping – from your porch or into a pool – no matter where you’re located in the world. This cohesive act gives people a sense of commitment, but also a feeling that we’re all able to connect – for a common cause, for loved ones, for friends – without being limited by borders or bodies of water. With that, we’re lucky to be partnering with a great organization to kickoff our launch: Solving Kids’ Cancer. They’re doing amazing things in supporting children who are battling cancer through support for therapeutic development and cancer research. We’re thankful to be in a situation to help out such a great organization and kids like my cousin who are fighting AND winning everyday. Take a moment to learn more about us and then grab a camera & another person or tripod to capture & upload your moment in the sky, and support Solving Kids’ Cancer.